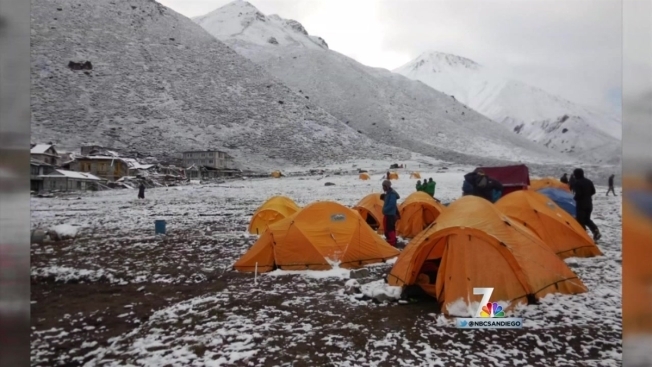 A San Diego hiker who survived the devastating 7.8-magnitude earthquake in Nepal followed by an avalanche thought she was going to die in the disaster and was in disbelief when she came up for air. “I thought, ‘This is where I die,’” said Kathleen “Kat” Heldman, recounting her harrowing experience for reporters in San Diego on Tuesday. “Going through the earthquake and the avalanche was terrifying. It was horribly devastating to see what happened to people there and all the people who lost their loved ones,” she added. 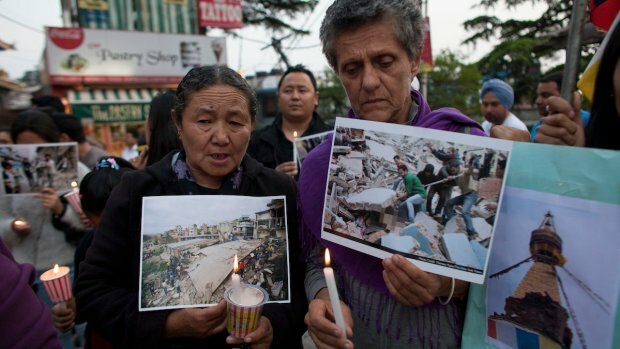 The still-rising death toll from the quake has reached more than 7,500. 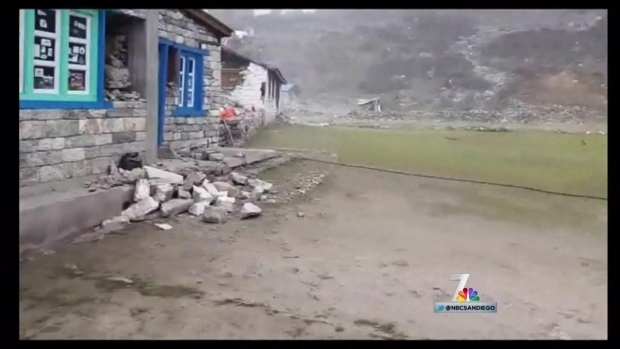 NBC 7's Candice Nguyen speaks with El Cajon resident Oscar Olea, one of four local hikers who survived the deadly earthquake in Nepal. The friends caught the quake on video as the disaster unfolded. Heldman traveled to Nepal last month with her husband, Kevin Krough, and their friends Oscar Olea and Brigida Martinez, setting out on the hiking trek of a lifetime. The quartet was in the small Nepalese area of Kyanjing Gompa when the quake hit changing the course of their trip – and their lives – forever. The friends were in a tea room waiting to have lunch when the earthquake struck, Olea told NBC 7 Monday night. What happened next is something Heldman said she will never, ever forget. “The whole earth started shaking. The whole building was rumbling. There was this loud, deafening noise and I looked at our guide and his eyes were bugged out and white and he screamed, ‘Earthquake! Run!’” Heldman recalled. Heldman said everyone began running out of the building as the earth shook uncontrollably beneath their feet. She realized Martinez was still inside the building and she ran back inside the crumbling structure to get her friend. After they came out safely, Heldman said they were in utter disbelief. The group captured some of the earthquake and its aftermath on video. Heldman and her friends, however, did not have much time to make sense of the quake that had moved the earth. Moments later, they had to run for their lives again as an avalanche struck. Seconds later, Heldman felt the ice and snow plowing against her body. “I felt it hit me and I felt like I was doomed,” she said. Heldman quickly dove behind a rock wall and tried to protect her head as the avalanche continued to barrel down on her. She said that’s the moment she thought she for sure wouldn’t make it out alive. A few minutes after the avalanche, Heldman and her group dug themselves out of the snow. The scene unfolding before their eyes was the stuff nightmares are made of. The hiker said she’ll never forget the image of people carrying others to safety: her small-framed guide hoisting a full-grown, unconscious man on his back as he walked up a hill; a man carrying a baby who was somehow still alive. “The rest of the day was in a daze. All we did was try to find missing people,” said Heldman. She and her group spent the next few days stranded in the area, trying to help the injured and find food and shelter. She said Martinez is a nurse and used her skills to tend to earthquake victims. When her group was finally able to fly home days later, Heldman said she couldn’t help but feel a huge sense of guilt. Heldman said she and her husband and friends had left a tiny village that was completely destroyed by the earthquake just hours before the quake hit. “Our lives were saved by three-and-a-half hours,” she added. Agents Punished for Student "Forgotten in Cell"
Heldman feels so fortunate to be alive, she’s now dedicated to helping other survivors in Nepal. She has started a GoFundMe page to raise money for residents of rural Nepalese villages who lost everything in the disaster. She said the money will help survivors rebuild. As she counts her blessings, Heldman is also planning a trip back to Nepal next year on the same date as the earthquake. “It would be a memorial trip," she said. "Maybe we will try to climb that mountain we were trying to climb."